Have you seen the International Space Station? It is visible with the naked eye! This is the easiest way to spot the station. 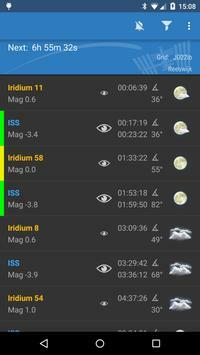 ISS Detector will tell you when and where to look for the International Space Station or Iridium flares. You get an alarm a few minutes before a pass. You will never miss a pass of the International Space Station and you will never miss the bright flashes of the iridium communication satellites. ISS Detector will also check if the weather conditions are right. A clear sky is perfect for spotting. Extensions will enhance the functionality of ISS Detector. 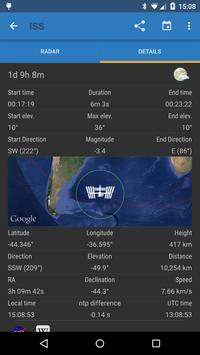 With an in-app purchase you can add comets and planets, amateur radio satellites and famous objects, like the Hubble space telescope or the Chinese space station Tiangong. • Share sightings with whatsapp, twitter, gmail, email etc. 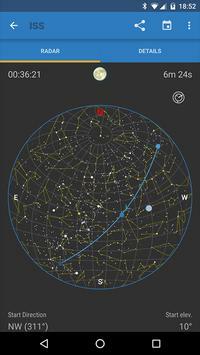 Track planet and track comets as they come closer to earth. Perfect for C/2011 L4 Panstarrs in March 2013 or C/2012 S1 ISON in November 2013. 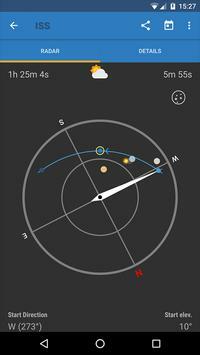 ISS Detector combines data from Nasa, Heavens-above.com, minorplanetcenter.net and weather from yr.no.